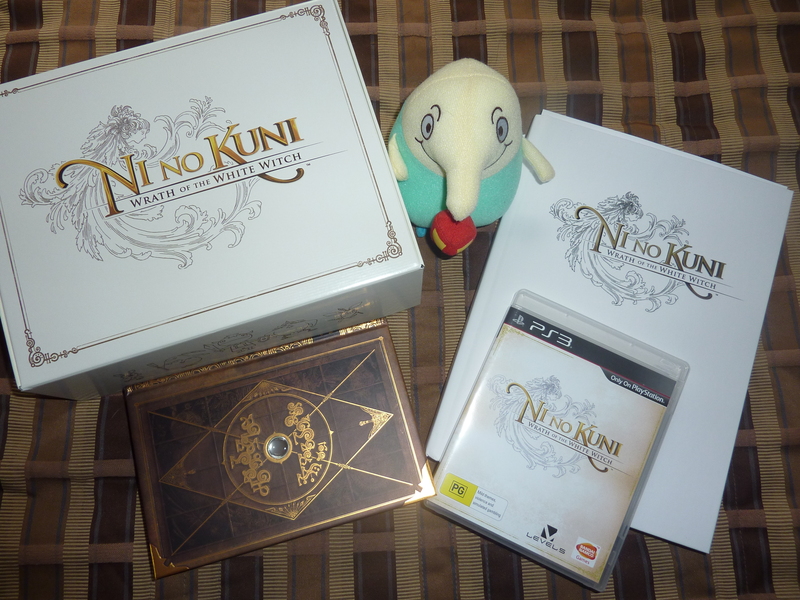 Since Ni No Kuni has been greedily gobbling up all my time (or more accurately I haven’t had the resilience to do much but play it in my spare time) I thought I should probably review it so at least I’m writing something. I’ll break my review down to the basic concerns most people have about games: graphics, combat system, storyline, post-game and replayability. Artwork for Ding Dong Dell – the first town you visit in the new world. Graphics: I suppose for some people cell shaded graphics are not cool, but for fans of JRPGs and Studio Ghibli in particular the graphics of this game are brilliant. You feel like you are playing a Studio Ghibli movie (which is their goal and they certainly achieved it). Then again, in a world where Minecraft is epically popular you’d think graphics are less of a concern. The beauty and imagination of the world, the appearance of the many towns, fields and dungeons you visit is something even a casual gamer is sure to notice. You really will feel as if you are traveling across an entire world during the course of your adventure. Combat system: The combat system is fairly simple to use once you progress to the point where you have a familiar. To simplify this, familiars are like Pokemon, lots of different fantasy creatures that fight on your behalf, can perform a set number of moves and you can eventually capture more as you fight them. That might sound like an insult, but I love Pokemon so please don’t read it as such. There are also many deviations from Pokemon, the capture method is more difficult and random for starters. Not only does Oliver (the character you play as) have three familiars, but as team members join your party they too have familiars. You can switch control between your team mates as you please to use their own spells and abilities or those of their familiars, or you can just set tactics for the team. Tactics can be changed easily by which ever character you’re controlling in battle. One frustrating thing with the battle system that started to irritate me more and more as I progressed through the game was the fact that when ANYONE (not just your opponent) used a special move unless the spell or special move you had just cast was at a certain point it was cancelled. Not just that, but you still lost the MP for the move and had to wait before you could reuse the spell/move as if you had successfully done it. This happens even when your team mates do special moves and it got to a point where in anything but boss battles I was giving tactics to not use abilities. This is my only issue with the combat system. Storyline: Non-spoiler – Wonderful, sweet, heart breaking, at first glance may come off with a childish sheen, but upon deeper inspection is a great deal more. Spoiler-tastic (do not read unless you have at least fought the Shadar boss). From the beginning we learn Oliver’s quest is driven more from a desire to revive his mother than to save the world. You might think me cold-hearted when I say this, but I didn’t want his mum to be resurrected. Certain deaths should be final (I’m not totally against all returns to life, just as long as they are handled well) and this death felt like it should be final. I put my faith in Studio Ghibli to not let me down and they did not. I was wondering how they would handle the Alicia/Oliver’s mother’s resurrection and they employed an inspired twist that was both not predictable and very clever. I also adored how both the villains of Shadar and The White Witch were handled, not mindless villains but people who suffered intense despair and loneliness. Want to fly around a fantasy world on the back of a dragon? Yes please! Post Game: Post game is full of ‘golden’ versions of familiars to catch, extra tasks with great bonuses (which also reveal a lot of back story to the world which is interesting to know), supped-up bosses to re-battle, a new ultimate boss and plenty to do. I’m currently playing post-game now. You can also go to the Casino and unlock all the animated scenes of the game for relatively little in-game cost. Re-playability: Personally, for time-strapped me, I probably wouldn’t play it again anytime soon. There’s no alternate endings and no option to play ‘new game+’ that I could see. However if I had a time turner or some such wonderful device I would definitely go back for more. Trophies: There are no tricky trophies where you have to do a certain thing at a certain time early in the game that you can miss and be frustrated about. Very grateful for that. All the trophies are achievable, but several require a high level of time and patience. Platinuming the game is not impossible, but I imagine will take 80+ hours of game play. Not good for productivity when in the house of a writer. The extra-packed limited edition I bought.